A butter tart is a type of small pastry tart highly regarded in Canadian cuisine and considered one of Canada's quintessential desserts. The tart consists of butter, sugar, syrup, and egg filled into a flaky pastry and baked until the filling is semi-solid with a crunchy top. The butter tart should not be confused with butter pie (a savoury pie from the Preston area of Lancashire, England) or with bread and butter pudding. Recipes for the butter tart vary according to the families baking them. Because of this, the appearance and physical characteristics of the butter tart – the firmness of its pastry, or the consistency of its filling – also varies. In general, the English Canadian tart consists of butter, sugar, and eggs in a pastry shell, similar to the French-Canadian sugar pie, or the base of the U.S. pecan pie without the nut topping. The butter tart is different from pecan pie in that it has a "runnier" filling due to the omission of corn starch. 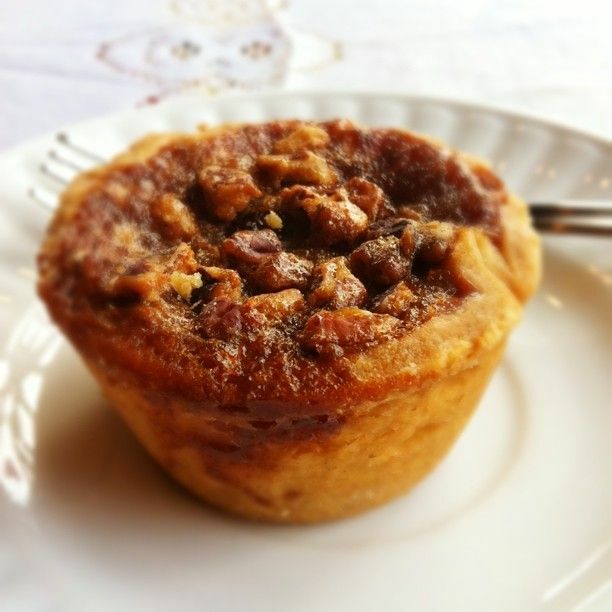 Raisins are in the traditional butter tart, but walnuts, or pecans are commonly added. However purists contend that such additions should not be allowed. Other additional ingredients may include currants, coconut, dates, butterscotch, chocolate chips, peanut butter, maple syrup or chai. Treacle tart: which is an English pastry made with golden syrup or treacle. The earliest published Canadian recipe is from Barrie, Ontario dating back to 1900 and can be found in The Women’s Auxiliary of the Royal Victoria Hospital Cookbook. Another early publication of a butter tart recipe was found in a 1915 pie cookbook. The food was an integral part of early Canadian cuisine and often viewed as a source of pride. Similar tarts are made in Scotland, where they are often referred to as Ecclefechan butter tarts from the town of Ecclefechan. In France, they are related to the much more common tarte à la frangipane, that differs from the basic Canadian recipe only by the addition of ground almonds. Butter tarts are an integral part of Eastern Canadian cuisine and are objects of cultural pride of many communities across Ontario and indeed Canada. This cultural and community connection with the tart has spawned butter tart themed tourism such as the Butter Tart festival at Muskoka Lakes, Ontario, the trademarked "Butter Tart Trail" at Wellington North, Ontario and the "Butter Tart Tour" in Kawarthas Northumberland, Ontario. The two competing associations have since resolved their dispute through the mutual agreement to modify "The Butter Tart Tour" to "Kawarthas Northumberland Butter Tart Tour". The first Kawarthas Northumberland Butter Tart Tour Taste-Off was launched at the Flavour Festival in Peterborough on Sunday, April 28, 2013, where four bakeries were crowned winners by a panel of celebrity judges. This panel of seven tasters ranked more traditional plain and raisin butter tarts, and specialty butter tarts that included ingredients like maple syrup, bacon, chocolate and raspberry. The group of judges each expressed their own preference about whether the quintessential butter tart should be firm or runny, with raisins or without – with the final decision evenly split. In the end, four locations were dubbed favourites in five categories, as determined by the judges and public polling: Best Crust – Country Mart in Buckhorn; Best Filling – Doo Doo’s Bakery in Bailieboro; Best Specialty Butter Tart – Doo Doo’s in Baileboro; People’s Choice – Cravings Bakery in Peterborough; and Best Overall – Betty’s Pies and Tarts in Port Hope. Subsequently, the first "Ontario's Best Butter Tart Festival and Contest" was held in June 2013 in Midland, Ontario. The contest portion of the festival had 80 entrants in 2013; the top winners were (1st) Nancy Dillen of Barrie, (2nd) Elaine Martin (The Ladybug Café) of Midland, (3rd) Laurie Gaudet of Orillia, (Hon. Mention) Jim Downer (SerendipiTea Tea Room) of Midland and (Hon. Mention) Kathy McHugh (Kathy's Bakery) of Orillia.